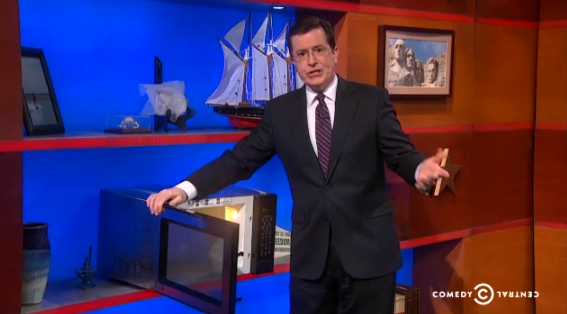 We like to think that Fox News’ Bill O’Reilly and Stephen Colbert are secretly super best friends who sit in a treehouse and giggle about their next moves, because how else would an auction of the microwave Colbert stole from O’Reilly’s green room in 2007 be possible? Or we’re all just lucky the universe loves comedy. It’s signed by Colbert and O’Reilly — “if he signs it.” All proceeds will go to the Yellow Ribbon fund, a charity that helps military families. As of this afternoon, the top bid on the microwave was at $85,400. O’Reilly’s Obama interview notes are currently going for $30,000.